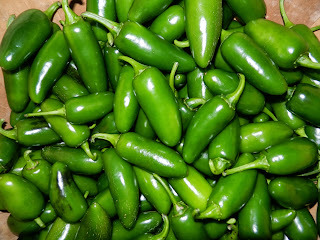 Home » Vegetables » How do you like your Jalapeños? How do you like your Jalapeños? Do you like your Jalapeños pickled so you can savour them, or do you make a batch of poppers and devour them all in one go? We eat a lot of pickled Jalapeños, but I will confess they are mostly store bought. Sometimes if I am too lazy to make poppers I will slice up some Jalapeños and put them in the pickle jar – they don’t keep too well this way, but I find that is not a problem – they are usually gone in a day or two. I don’t deep fry the poppers, so they probably ought to be called something else. I halve them, stuff in some cheddar, a few breadcrumbs on top and into the oven until everyone starts asking if they are ready. Last week Jack came home to tell me that cream cheese with Jalapeños was really good on bagels (a reward from his generous Human Geography teacher to the whole class for not scaring the substitute teacher too badly). I didn’t even know he liked cream cheese! I don’t buy it, but I do make a nice vegan quark with soy kefir – so I might try that in the next round of poppers. Any good recipes you want to share? « Happy 1st National Kale Day!